Prescribed an expensive prescription weight loss drug? We have a complete list of coupons available to everyone! Looking for a specific coupon for your diet pills? Refer to our coupon list below. No need to sign up or register. You simply click, print and save! It's really that easy. 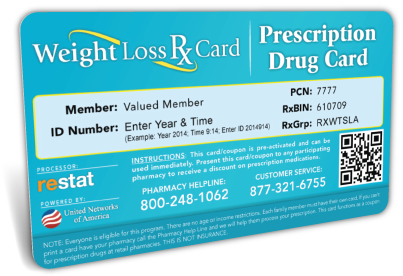 All of our prescription weight-loss coupons are accepted at over 60,000 pharmacies nationwide. They're ready to be used immediately to save you up to 75% on your prescription weight loss medication. Remember: our coupons do not expire and can be used for generic and brand name prescription diet medications. Don't see a coupon for your medication? Contact Us and let us know! OR download a free Weight Loss Prescription Savings Card. Simply bring the prescription drug card into a participating pharmacy with your prescription and save on your medications!